Features Leigh Alexander, Craig Anderson, Andrew Bacevich, Nina Huntemann, Sut Jhally, Elizabeth Losh, Matt Payne, Clive Thompson, and others. "Joystick Warriors really nails the perennial question of violence and video games. With a diverse array of commentators from academe, the game industry, and the military, the film refreshingly bypasses the usual tired and distracting debates about whether games cause murder. What we get is a nuanced picture of how large swaths of commercial gaming culture normalize violence, a trend that has implications that range from a loss of everyday empathy to acceptance of an increasingly militarized world. I know of no other film that takes on these issues so expertly, directly, and artfully. After watching only the first ten minutes, I had already changed my plans to use it in class this semester." "Essential viewing for all. Makes a significant contribution to the urgent discussion about the impact violent entertainment has on society." "A vivid and sometimes startling journey into gaming worlds and their most violent extremes, this film leaves little doubt about the imbrication of empire and masculinity driving the bodily habituations that video games demand. Shifting our attention from the fatigued debates about the reproduction of violence to the vaster and more damning implications entailed in the normalization of perpetual war, the film demonstrates that these forms of entertainment do not simplistically create violent users. Rather they reflect back to us the already present saturation of violence we might rather not be forced to acknowledge." "Joystick Warriors is sobering, articulate, and willing to ask questions and seek answers beyond the overly-reductive, blame-game red herrings of whether or not video games cause violence or create violent people. Instead, the film reveals the imbricated relationships between games, the commodification and aestheticization of violence, the fantasies of control and interactivity, the military-industrial-entertainment complex, as well as race, gender, class, and nation. In short, Joystick Warriors takes seriously video games -- from developers to players to politicians -- as participants in and producers of cultures of violence, militarism, and fear. A must see for classroom, community, and gamers especially." 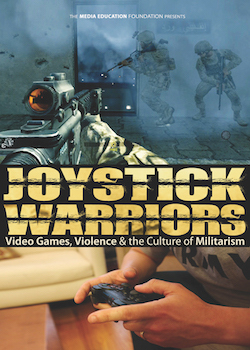 "Joystick Warriors offers a visually stunning, highly insightful and very provocative critical exploration of the immensely popular FPS genre of video games and their connections to contemporary narrations of militarism and masculinity. This is a fabulous resource for teaching about the geopolitics of video games and makes a very timely and valuable contribution to the emerging debates around video games and popular culture." "Smart, engaging, and thought-provoking, Joystick Warriors delivers the latest research on video games and brings much-needed attention to what happens when people regularly engage in virtual killing. It could not be more timely or important." “Joystick Warriors presents a much more nuanced and productive discussion of violent video games and their effects than the traditional question of whether violent game exposure increases aggression. As a cultural phenomenon, violent video games have the potential to produce much more profound effects on society, particularly in terms of desensitizing young people to violence, reducing the capacity for empathy and glorifying weapons and militarism, that might not be apparent in terms of an individual’s violent or aggressive behavior. This film does an excellent job of presenting those very important issues." "As a media literacy educator, Joystick Warriors is a necessity for my classroom. Using powerful examples and expert analysis, the movie weaves through a detailed critical analysis of the videogame industry and their products." "Joystick Warriors combines incredible insightfulness with accessibility. Even as someone who devotes my career to studying the normalization of violence and the gendered dynamics of that normalization, I found this video strikingly original and deeply engaging. Whether or not video games encourage violence, they normalize violence and glorify tough masculinity -- and this video shows how, even to doubters." "This documentary offers a more nuanced perspective on violent games that goes beyond the now stale discussions of addiction and aggression." "Joystick Warriors is an unflinching and thought-provoking examination of violence and video games. Avoiding the cliched narratives that tend to define the debate, the documentary steps back to reflect on a much deeper level about the role of militarism in our culture. Gender, guns, the military-industrial complex and a host of issues are tied together in a revealing analysis of why digital violence, and war more generally, have a profound effect on who we as as human beings. A fantastic resource." "More than a dissection of violence in video games, Joystick Warriors examines the broader cultural effects of first-person shooter games and asks what happens when belligerence becomes the go-to solution for social conflict. A powerful examination of this sector of the game industry." "Joystick Warriors presents a wide-ranging critical take on the role of military and violent videogames in contemporary culture. With excellent access to leading academics and commentators, interspersed with extensive in-game footage and news and pop culture sources, the film presents its argument in extremely compelling fashion. Whilst centred on the USA, given the proliferation of military videogames across the West the findings of the film are extremely thought provoking for those us whose citizens consume military games in large quantities. The film offers a forceful argument that historically the debate on media effects has been preoccupied with a focus on violence –- in short, do games lead us to kill? –- Instead it suggests that more pressing and important questions have been lost such as do violent games result in desensitisation? Do they promote certain forms of militarized/violent masculinities which have the potential to shape our cognitions and attitudes? Do they reduce our critical faculties such that we are less questioning of whether we should be involved in war full stop? In raising such questions, Joystick Warriors opens up a vital space for asking questions which the film makers rightly identify as crucial. Yet the film arguably could go further –- it should make it clear that the criticisms of the existing work on videogames and violence (which are primarily centred on disaggregating games from other effects and methodological issues related to how we account for behaviour) are just as compelling in demonstrating themes such as desensitisation. What the film ultimately presents is a series of crucially important arguments –- ones which we should all engage with and reflect on -- what we now need is the research to start to seek answers to these questions before we can say with real certainty how military games do or don’t shape the culture of militarism."